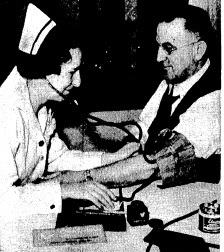 Dr. Don Deal (1879-1952) performed Sangamon County’s first blood transfusion in 1914 – apparently successfully. The patient was Mrs. Henry Harney of Middletown, who came to St. John’s Hospital in Springfield for removal of a tumor, according to the Dec. 20, 1914, Illinois State Register. “A quart of blood was transfused from the veins of her husband, with result that the patient became much stronger and better able to withstand the shock of an operation for removal of the tumor,” the Register said. There’s no indication in the skimpy coverage of the procedure about what precautions, such as rudimentary blood typing, Deal employed. Her husband is a very large, strong man, and it was decided to transfuse blood from his artery into the vein of his wife. The operation was performed and a quart of blood was taken from Mr. Harney’s right artery and injected into Mrs. Harney’s left vein. The operation proved a success and the patient is getting along nicely. On Dec. 23, the Register reported that Mrs. Harney had improved greatly. Local newspaper coverage of the transfusion ends there. The lack of other followups, especially an obituary, suggests Mrs. Harney survived both the transfusion and the surgery to remove the tumor. But the newspaper’s omission of Mrs. Harney’s first name makes it impossible to tell for sure; other genealogical research by SangamonLink also turned up no information on her. The first unquestionably successful transfusion in Springfield took place in April 1915, when 25-year-old Margaret Snape donated a quart of blood to her mother Ella, who was dangerously ill with peritonitis. Ella Snape’s husband Harry and all five of her daughters had volunteered to be blood donors; Margaret, the youngest, and “abundant with health,” the Register said, was chosen. Neither the Register nor the Illinois State Journal, which also reported on the Snape case, identified the doctor, but the Journal said the transfusion “was the fourth to be performed by the physician in charge of the case,” suggesting that also probably was Deal. Ella Snape lived until 1943. Ironically, she outlived Margaret Snape Clendenin, who died in 1925. Transfusions continued sporadically over the next three decades in Springfield, but the procedure was still experimental and almost always a last resort. Obtaining a transfusion, and then surviving it, required a combination of community support and luck. They often weren’t enough. In 1916, John Grieme, 23, died of peritonitis caused by appendicitis despite a transfusion from his brother Fred. And John L. Scott, assistant principal at the high school, seemed to rebound after each of a series of transfusions between January and March of 1920, but he died in May. As late as 1935, it took repeated calls for volunteer donors to provide blood transfusions for two young boys. State troopers, Boy Scouts and members of the American Legion offered blood to 8-year-old Jackie Gragg when his case was publicized in June 1935. He recovered from rheumatic fever after seven transfusions. That same week, George Barlow, 15, developed Bright’s disease, a kidney ailment, following scarlet fever. Like Gragg, Barlow had a rare blood type, and the Illinois State Journal was asked again to solicit blood donors. No suitable blood could be found, however, and Barlow died June 8. 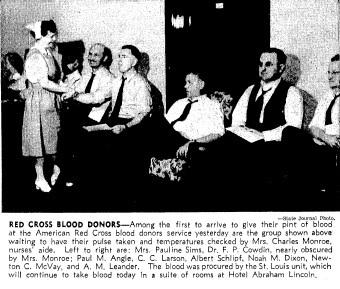 Organized blood collection began in Springfield in early 1942, a few weeks after the attack on Pearl Harbor. The first donations went to the American Red Cross, which earmarked its blood collection for the military. Meanwhile, Dr. Ed Bernard announced that St. John’s Hospital would begin collecting blood and plasma for civilian use. The first 25 donors were selected by Mayor John “Buddy” Kapp, Bernard said, according to the Journal. “Donors should be healthy adults,” Doctor Bernard said, preferably between the ages of 21 and 60 years.” Donors will be tested for such diseases as malaria, syphilis and tuberculosis before being accepted, according to hospital officials. Deal, who was still practicing medicine in 1942, compared blood banks to savings banks in comments to Journal editor and columnist Emil Smith. “Transfusions of blood have become common procedures. We have had to take the blood of the person needing transfusion and make certain tests to determine what ‘type’ it is. Then we have had to find some person with the same type of blood. All that has taken time and the patient may have died or lost so much blood that transfusion has not benefited him. “But with the bank all we have to know is what type his blood is. Then we draw from the bank and give him the transfusion without a moment’s delay. Meanwhile, friends have come in offering their blood. We will accept their deposit of blood and put it in the bank for future use. In 2019, after several changes in organization, Springfield blood collections and distributions were coordinated by the Mississippi Valley Regional Blood Center. Clients included 88 hospitals in Illinois, Iowa, Missouri and Wisconsin. The regional group’s primary distribution center in Davenport, Iowa, handled more than 250,000 units of blood components yearly. This entry was posted in Medicine, Public health. Bookmark the permalink. They didn’t confirm if his blood type was a match? Sounds lucky she survived. Mr. Pool: Sorry if I didn’t make myself clear. The newspapers didn’t say what precautions Dr. Deal took, but that doesn’t mean he didn’t take any. I assume he did all he could. But, yes, even if he used the best technology available at the time, transfusion patients who survived were indeed lucky.